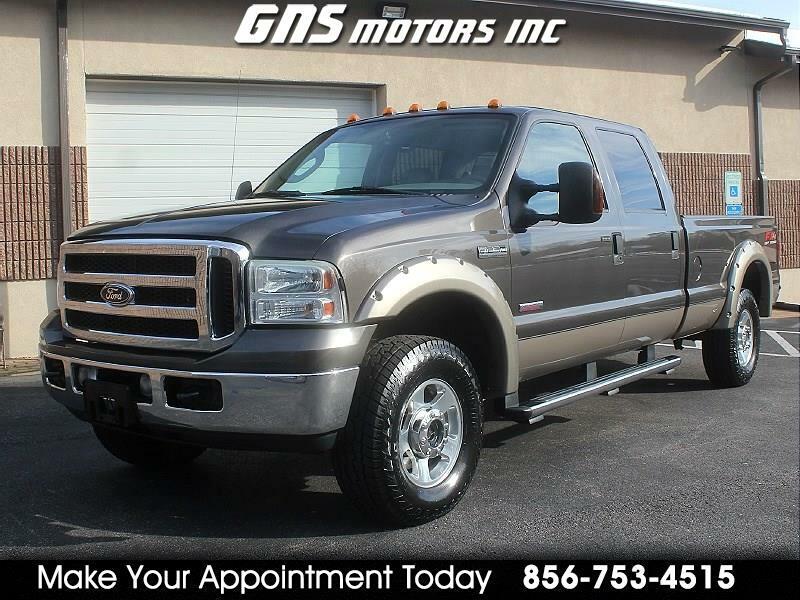 Used 2005 Ford Super Duty F-250 Crew Cab 172" Lariat 4WD for Sale in West Berlin NJ 08091 GNS Motors Inc.
2005 FORD F250 SUPER CREW LARIAT DIESEL 4X4 * 1 OWNER!! BULLETPROOFED!! THIS ONE OWNER!! FULLY MAINTAINTED AND BULLETPROOFED!! 2005 FORD F250 SUPER DUTY CREW CAB LARIAT FX4 TURBO DIESEL 4X4 LONGBED IS IMMACULATE!! CHECK IT OUT ON YOU TUBE https://youtu.be/04Nv2GlAU58 * THIS VEHICLE IS FULLY LOADED!! WITH ALL POWER * HEATED LEATHER SEATS * 6 DISC CD CHANGER * WOOD TRIM * POWER SLIDING REAR WINDOW * STEERING WHEEL CONTROLS * CRUISE CONTROL * TILT WHEEL * KEYLESS ENTRY ALARM * BEDLINER * FITH WHEEL MOUNT * CHROME RUNNING BOARDS * CHROME FRONT AND REAR BUMPERS * ELECTRONIC TRAILER BRAKE CONTROLLER * TOW PACKAGE * ALLOY WHEELS WITH NEW TIRES AND NEW BRAKES!! 209,894 HIGHWAY MILES!! 25 YEARS IN BUSINESS WE PRIDE OURSELVES IN NO HIDDEN FEE'S NO PRESSURE ENVIRONMENT!! MUST SEE!! WE NOW OFFER AS LOW AS 3.99% FINANCING!! .. ALL CARS COME WITH A FREE CARFAX .. WARRANTIES ARE AVAILABLE ON MOST VEHICLES .. PLEASE CALL 856-753-4515 .. TO MAKE AN APPOINTMENT TO COME SEE AND DRIVE .. OUR VEHICLES ARE KEPT IN OUR INDOOR SHOWROOM SO AN APPOINTMENT IS NECESSARY .. FOR MORE PICTURES AND TO VIEW OUR INVENTORY ONLINE GO TO... WWW.GNSMOTORS.COM ..